100 Black Cake 1 lb. flour 3/4 lb. butter 1/2 lb. sugar 1 pint milk 4 eggs 1 teaspoon soda 2 glasses brandy – spices raisins currant & citron to your taste. Fruit cake no.1. 2 lbs flour 2 lbs currants 1 & 1/4 lb. butter 1 1/4 lb. sugar 16 eggs 1/2 an ounce nutmeg 3/4 pint wine the same also of Brandy. Fruit Cake no.2. 1 lb. flour 1 lb. sugar 1 lb. butter 10 eggs 1/2 ounce mace 1/2 ounce nutmeg 1 & 1/2 lbs raisins 2 lbs. currants 1/2 pint brandy 1 lb. citron. Superior Fruit Cake No. 3. 2 lbs. butter 1 1/2 lbs. sugar 6 lb. raisins 6 lbs. currants 2 lbs. 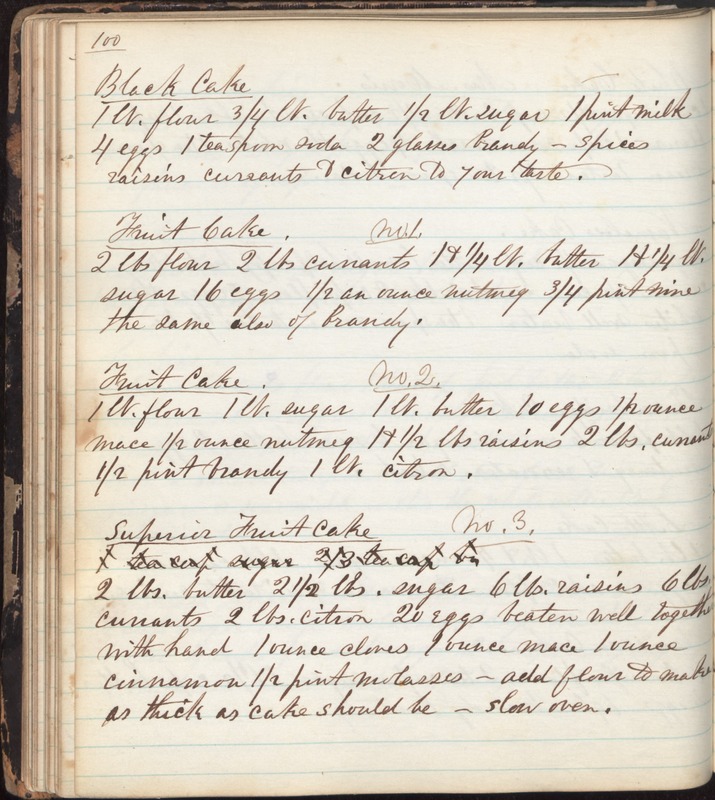 citron 20 eggs beaten well together with and 1 ounce cloves 1 ounce mace 1 ounce cinnamon 1/2 pint molasses - add flour to make as thick as cake should be - slow oven.